Mountain. 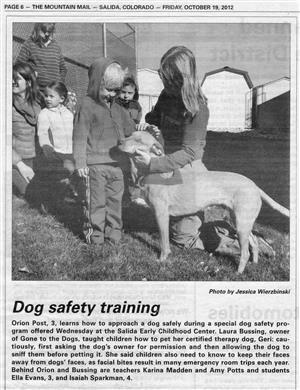 MailLaura and Tony Bussing of Gone to the Dogs are teaching preschool-age children how to safely meet dogs and avoid being bitten during a series of dog safety classes in local schools. A survey by the National Center for Disease Control and Prevention in Atlanta reported dogs bite nearly 2 percent of the U.S. population annually – more than 4.7 million people. The majority of bites are to children. The Bussings said they will teach local pre-schoolers how not to become a statistic. Interactive classes will use Geri and Maggie, owned by the Bussings, to help teach kids how to safely pet a dog. Both dogs have the Canine Good Citizen designation from the American Kennel Club. The Bussings will teach the safety classes to all preschool youths in Salida. The schedule includes: April 19 at Strawberry Door, April 20 at Strawberry Door, April 21 at Son Shine Preschool, May 4 at Head Start. 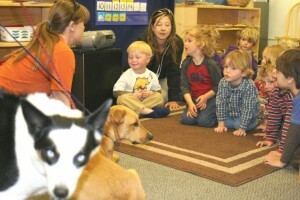 Dog Safety Classes began April 12-13 at Chaffee Montessori preschool. SALIDA — With construction jobs scarce, Salida builders Tony and Laura Bussing switched careers. The couple opened Gone to the Dogs pet boutique. The store at 119 E. First St. in Salida offers dog sitting and a range of other services previously unavailable in the small mountain town. 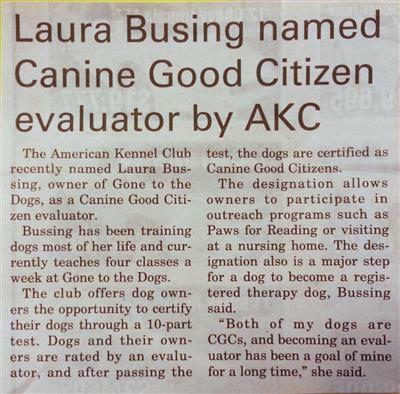 The business is proving so successful the Bussings say they may forego a return to the construction industry.”Tony has been a dog behavior consultant for 17 years and has always done that on the side,” Laura Bussing said. “So we asked, ‘What is missing in downtown Salida for both locals and visitors?’ and came up with ‘Gone to the Dogs.’ ” The area’s construction setback has been severe, she said. “Construction has been almost dead in the water from the economy and people are putting off building,” she said. 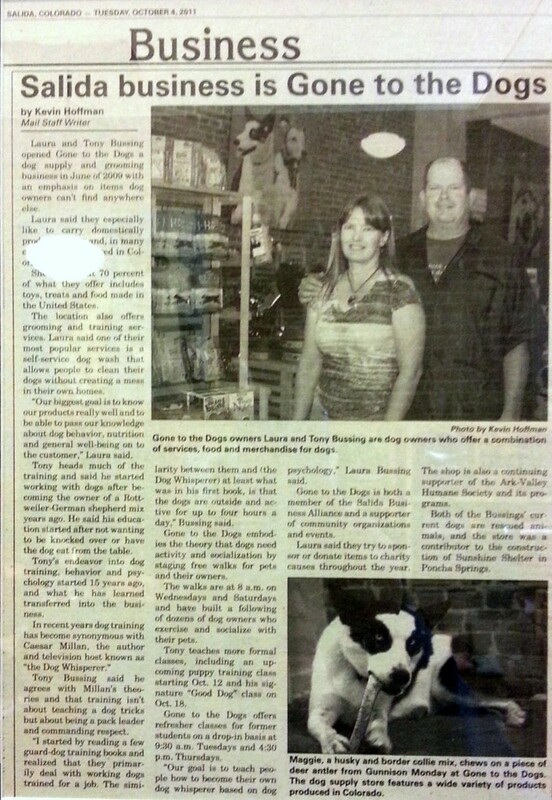 The pet boutique operates out of a 1890s building that recently was remodeled. The building maintains its turn-of-the-century flare with exposed brick walls and wood floors. Dogs and their owners can sit in a front-window seating area and partake of the store’s K-9 Cafe, where the owners can sip coffee, surf the Internet or read magazines.”We like that people do not have to tie their dogs up outside if they want to have a cup of coffee,” Laura Bussing said. The coffee and tea are offered free of charge alongside a donation jar with the proceeds going to the Arkansas Valley Humane Society. Past the K-9 coffee area is a shop chock full of dog accessories ranging from leashes and collars to toys, bones, treats, coats and shampoos.Having worked as a “green” builder, Laura Bussing is environmentally conscious, so many of the toys are made of recycled materials. “The dog toy trend is going toward recycled products like West Paw out of Montana and Planet Dog in Maine because they have none of the bad stuff found in rubber,” Laura Bussing said. The dog treats are organic and healthy, made without wheat, corn or soy. Many of the products hail from Colorado, such as the natural cow and lamb chew bones. “We try to get products that are locally made and I would say, overall, 70 percent of our items are made in the U.S.A.,” she said. The shop offers booties, backpacks, doggy water bottles and float coats as well as, “the cutest line of pet cards,” Laura Bussing said. Past the retail area is a large playpen where dogs can socialize while they wait for their owners to pick them up from grooming. Tony Bussing is the dog washer. He uses an elevated wash station and natural, botanical products to pamper the pooches. A self-service wash station also is available. “Our claim to fame is that we don’t kennel dogs before or after grooming, so it is very stress free,” Laura Bussing said.The store also offers dog training, a fitness boot camp and birthday parties. A pet guide offers a comprehensive list of pet-friendly places in Salida from hotels and parks to pet portrait painters. 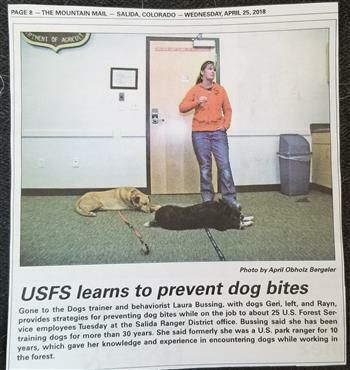 “We want visitors to be able to drop off their dogs and walk around to shop and eat and just plan to spend the day in Salida and get the most out of their trip with their dogs,” Laura Bussing said. For more information, visit www.SalidaDogs.com or call 719-539-1800. 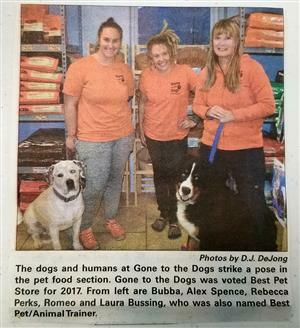 Gone to the Dogs, a local dog supply and services shop owned by Laura and Tony Bussing, has officially opened. 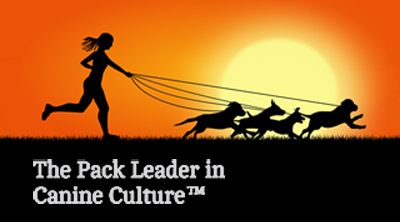 Many ideas for the shop are based upon Tony’s talent as a dog behavior consultant. Using his behavioral knowledge, they hope to combine necessary products and services with a friendly environment for canines. Products in the store are mostly organic or recycled and are made in the United States. Grooming offered is kennel-free or self-serve. A variety of inventory is available including collars and leads, beds, toys and home-made treats. If the Bussings don’t have what a customer is looking for, they’re willing to order it. “We also try to have a variety of pricing on our inventory.” Laura said. They want to be within the buying range of all dog owners. Kennel-free grooming focuses on the comfort of the dog rather than speed of service. Typically, large-scale groomers wash a dog and then put it in a kennel where it is blown-dry while they wash another. Being in such a confined space surrounded by dryers often stresses animals, they said. Self-serve grooming will also be available with supplies provided. “It’s a growing phenomena in larger cities.” Laura said. dogs are on-site for purchase. 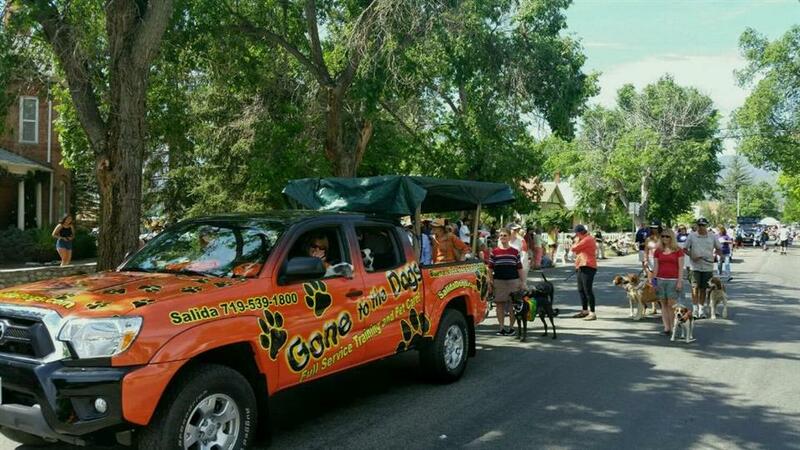 Gone To The Dogs is at 119 E. First Street, Unit B, Salida, CO. More information may be found at www.SalidaDogs.com or by calling (719) 539-1800. 015 FIBArk Parade giving out treats to all the doggies along the way! Our Hero Dog, Sugar Ray, is riding in the back. He’s our oldest customer!